Ancho Ranchero 70 Medium Dark Green Ancho 1000 Fresh Market Has a tall sturdy plant, very large fruit, somewhat lighter fruit, than OP Ancho. High yields. Ancho Vila 80 Medium Dark Green Ancho 1000 Fresh Market PVY PeMo Larger fruited, higher yielding hybrid with less pointed fruit than, OP varieties. Has a tall plant. Grande 75 Med. Thick Green to Red E Jalapeno 4,000 to 6,000 Market Processing TEV, PVY A New PETO hybrid with a very vigorous plant, very large fruitl and is a high yielder. Inferno 60-65 Medium Yellow to red D Wax 2500 to 4500 Market Pickling A pendant, hot banana type. For fresh market or pickling. Very. productive and uniform. Garden Salsa – F1 73 Medium Thick Green to Red C, Aneheim 2500 to 3500 Processing Market TMVO An anaheim type hybrid from PETO with thin skin and high yields. Used for salsa, roasting etc. Hungarian Heat 60 Medium Yellow – Red D Wax 2500 Market Processing High yields of straight, longer, slightly thinner hot banana pep_:, pers. Tall, sturdy plants. Hybrid #7 55 Thick Dk.Green – Red E, Jalapeno 4000-6000 Processing Market A new early jalapeno that is setting records for early yields plus, large fruit for growers. Try in 99. Jalapa 60 Thick Med. Green-red E, Jalapeno 4500 to 6000 Processing Market A very early, uniform, milder than Jalapeno M. for fresh market or home garden. Jalepe Mild Hybrid 65 Thich Green – Red Jalapeno 800 Processing Market A mild Jalapeno hybrid with 3″ fruitthat are mild and excellent for. processnig or market. Mexibell Imp. 70 Thick Green red Bell shape 2500 Home Garden Tall upright, vigorous plant. Outstanding for the bedding plant. trade. Mitla 65 Thick Dk. Green Red E, Jalapeno 4000 to 6000 Processing Market TMV An early Jalapeno M type that produces exceptional yields of very uniform large fruit. Upright plant, continuous set. Delicias 65-70 Thick Green to Red E, Jalapeno 500 or less Processing Market TMV, PVY, TEV A brand new, very productive PETO hybrid with much less pun-: gency than even Tam #11. Mesilla- 70 Thick Gr. To Brilliant Red B, Cayenne Lg. Thick 2000-4000 TMV, TEV, PVY A Lg. thick Cayenne hybrid with superior disease resistance and higher yield than OP’s. Pecos – F1 81 Thick Green to Red E, Jalapeno 6000 Processing Market A new elongated, pungent, very dark green Jalapeno hybrid: from Rogers. Has exhibited tendency for easier de-steming than others. Romanian Hot Hyb. 65 Medium Yellow – Red Wax 2 1/2 x 5″ 1,000 Market Home Garden A larger blockier, yellower fruited, and higher yielding Romanian (Semi-hot) hybrid. An outstanding choice to replace Romanian Hot. Super Chili 75 Thin Green Orange Red J, Exotic 40,000 to 50,000 Market Home Garden AAS Winner. Early, very productive. Home garden. An excellent substitute for Asian cooking. Super Cayenne 72 Thin Light Green Red B, Cayenne Lg. Thick 40,000 to 50,000 Market Home Garden AAS Winner. Early, very productive. Home garden. Tula – F1 Thick Dark Gr Red E, Jalapeno 4000 to 6000 Fresh Processing TMV A newjumbo (3-5 x 2″) Jalapeno hybrid from PETO that has per-: formed very well in trials and farmers fields. Resists purpling. Volcano 63 Medium Yellow to red D, Wax 2500 to 4500 Market Processing A superior, high yielding hot Hungarian wax type pepper. Good foliage protection. Ancho Gigantia 90 Med Thick Green to Browr Ancho 1,000 to1,500 Fresh Market A larger fruited Ancho type that will hold its size better in:: warmer seasons. Anaheim (Mild) 75 Med Thick Dark Green-Red C, Long Green 250 and less A mildly pungent pepper with continuous fruiting. Anaheim TMR 23 (Hot) 75 Med Thick Dark Green-Red C, Long Green 900 to 3500 TMV A pungent pepper for canning, freezing or market. Cayenne Golden 72 Thin Green -Yellow B, Cayenne 1000 to 1500. A golden- yellow version of the cayenne pepper. Cayenne Long-Slim 72 Thin Green- Red B, Cayenne 30,00 to 50,000 Dehy. Processing Very productive, pungent, home garden variety. Cayenne Large Red Thick 75 Med Thick Green- Red B, Cayenne 30,00 to 50,000 Dehy. Processing The commercial variety of the long thin pepper used as a dried: ground powder. Charleston Hot 72 Thin Lt Green to Orange B, Cayenne 70,000 to 100,000 Dehy. Processing A New Hot variety developed by the USDA. Known as the hot-. : test Cayenne type. Resistant to many types of nematodes. Chiltepin 80 Thin Green- Red Oval Home garden A very hot, wild, miniature chili pepper usually harvested in the; wild in the southwestern U.S. Most homes in the southwest: have a plant or two growing in their garden. China Express 75 Thin Dk. 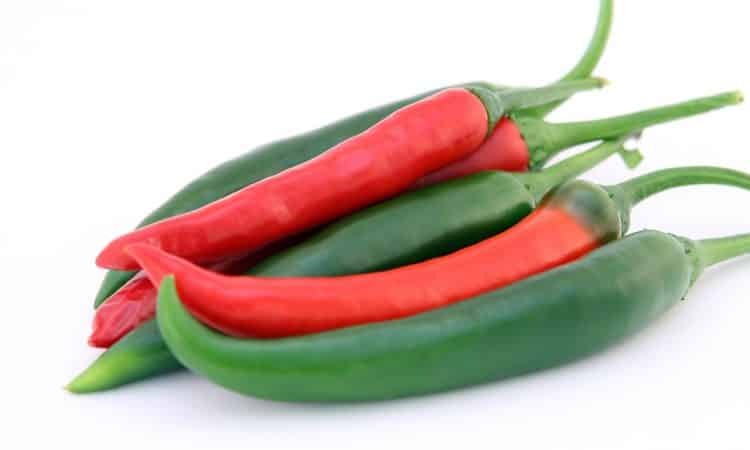 Green to Red J – 0 Exotic 60-80,000 Dehy Processing The pepper variety that adds the heat to those dishes in the: Chinese Restaurants. The fruit grow upright in clusters on the~’ ends of the branches. Cow Horn 75 Thick Dk. Green to Red Home Garden A 10″ long pepperwhose fruit curl at the tip and look like a large: cow horn. Hot, great for sauces. Early Jalapeno 63 Thick Green- Red E, Jalapeno 4000 to 6000 Processing Market Uniform, hot fruit, processing, market. Habanero (RED) 90 Thin Gr. to Bright Red H, Chinese 300,000 Plus Market Processing An even hotter strain of Habanero with large bright red fruit. Habanero 90 Thin Lt. Green-Orange H, Chinese 200,000 Processing Market The hottest pepper that fits both into fresh market or processing. Often used in the dried powdered form. Huasteco 80 Med. Dk.Green Red Serrano 2,500 to 4000 Market PVY,TEV,PeMV Huasteco has an upright 29-31 ” plant and its flexible stem provides resistance to damage during harvest. Fruit are 2-3″ in, length. Hot Portugal 64 Thick Green- Bright Red Garden -Mkt. Bears elongated narrow fruit, 7-8″ long, glossy scarlet with superb pepper flavor and medium heat. Hungarian Yellow Wax-Hot 70 MedThick Yellow- Red D, Wax 750 to 3000 Market Pickling Early, productive garden, market & processing. Jalapeno M 73 Thick Green- Red E, Jalapeno 3500 to 6000 Processing Market Uniform, pungent, processing & market. Jamaica Gold 75 Thin Green- Bright Gold H Chinense 150,000 Market A beautiful bright gold fruited variety that originated in Jamaical in the same family as Habanero but earlier. Jamaica Red 75 Thin Green – Bright Red H, Chinese 150,000 Processing Market A bright red variety that originated in Jamaica in the same family as Habanero but earlier. Mulato 80 Med Dk. Green-Brown F Ancho 1,000 to 1,500 Processing Market An ancho type pepper that at maturity turns brown instead oV red. Slightly shorter than Ancho 10 1. Nu Mex Joe E Parker 80 Thick Dark Green – Red C Long Green 1000 Processing Market An improved NuMex 6-4 type long green with thicker flesh,1 more uniform pods and higher yields. Medium Heat. Ole PVP 60 MedThick Dark Green-Red E Jalapeno 2500 to 4000. Processing Market A Ferry Morse jumbo Jalapeno variety with high yields on a: medium sized plant and medium hot fruit. Pasillo Bajio 75 Thin Dk. Green-Brown A, Pasilla 250 or less Market Thin cylindrical pods, brown at maturity, 6 -12″ long. Distinctive, mild flavor. Excellent for mole sauces. Pepperoncin! (GreGolden) 65 Thin Green -Yellow Inverted Tip. Mild Processing Market A pepperoncini strain that is known for superior eye appeal and flavor when used as a processed product. Fruit are also: shorter than the Italian strain. Red Cherry (Large-Hot) 75 MedThick Med. Green- Red G Cherry 3500 Processing Market Processing and home garden, pickling. Red Chill (small) 82 Thin Green- Red J Exotic 60-80,000 Processing, home garden, drying, sauce. Romanian Hot (semi-Hot) 70 MedThick Yellow -Orange Wax 1500 Processing Market A unique pepper used for processing and home garden. Santa Fe Grande 75 Thick Yellow – Or. Red D Wax May-00 A very prolific variety used in the southwest. Scotch Bonnet 90 Thin Green – Yellow H Chinense 200,000 Market Processing A popular hot pepper from the Carribian area. Similar in heat’, and shape to Habanaro except shorter. Serrano Chill 75 M Thin Green -Red I Serrano 2500 to 4000. Pickling Market PVY Shaped like a miniature Jalapeno. Very pungent for pickling,! market and sauce. Serrano Tampinqueno 75 M Thin Green- Red I Serrano 2500 to 4000 Pickling Market The predominant strain of Serrano used in the fresh market 1, production areas. Tam Jalapeno #1 (Mild) 67 Thick Green- Red E Jalapeno 900 to 3500 Processing Market PVY Milder than Jalapeno M. Processing & market. Tabasco 75 Thin Lt. Green- Red K frutescenes 80,000 Processing The hot sauce pepper with slender light green to red fruit that are very hot. 1.5″ long. TrInadad (Seasoning Pepper) 90 Thin Yellow to red Chinense 500 Market A variety found by Dave Dewitt from the Chili Pepper magazine, same family as Habanero, butwith very low heat. Used fori its fruity flavor in cooking. Floral Gem 65 Med Thick Orange-Red D – 0 Wax 1000 to 4000 Ornamental-Processing Early, highly ornamental with orange-red fruit. Pickled in the green state as Torrido peppers. Marbles 65 Thin Creme Yellow-Red Marble Ornamental A unique pepper variety with horizontal branches bearing many fruit that arel from cream to yellow to red in color. NuMex Twilight 70 Thick Grn-Yellow-Orange – Red Pequin shape 1000 Ornamental Many small fruitin all shades of coloron a plantwith green foilage. An excellent’ choice for an ornamental planting. NuMex Sunburst 70 Thin Bright Orange O DeArbol 500-1000 Ornamental 2 – 3″ upright fruit that are bright orange when mature. An excellent ornamental plant. Good flavor. NuMex Sunglow 70 Thin Bright Yellow O DeArbol 500-1000 Ornamental 2 – 3″ upright fruit that are bright yellow when mature. An excellent ornamental: plant. Good flavor. Pretty Purple 75 Med Thick Purple-Red D – O Wax 5000 Market Ornamental A purple, smaller fruited, purple leaved pepper with fruit having Sante Fe: Grande shape. Thai Hot 70 Thin Green-Red K – O Exotic 80,000 Market Small, low growing (8″)ornamental plants with numerous small, 1 fruits. Very: Hot. Varingata 75 Thin Purple-Red O Exotic 50,000 Ornamental A pepper with varigated foilage, white, green to purple. Fruit shape similar to: the Jalapeno or Santa Fe Grande.